Our contest has ended, however, We'd like to offer you 15% off your makeup palette purchase. Just enter code: MYSHOT at checkout and receive this special offer. 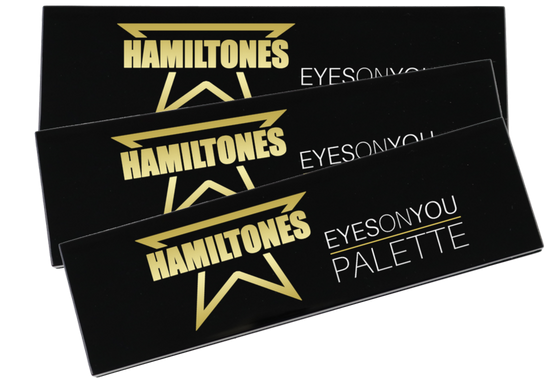 HAMILTONES EYESHADOW PALETTES HAVE ARRIVED! To celebrate, we're giving away 10 sets. On October 20th, 10 people will win one of our brand new 5-shade palettes. Full of your favorite Hamilton themes, you don't want to throw away your shade (get it) at winning. With the Holidays approaching, these will make the perfect gift for your Hamil-Obsessed friend or family member. ENTER CODE: MYSHOT at checkout to get your discount. Only one valid email per person is allowed. Winners will be randomly selected on October 19th, 2018 and announced via email and Instagram on October 20th, 2018. By entering this giveaway you are agreeing to opt-in to our email newsletter. You may opt-out at any time by using the link provided in the email text. In order to be selected for the prize you must be opted-in at the time of the drawing. Shipping times for prizes are estimated at 3 weeks after winners are announced. Winners will receive 1 eyeshadow palette each. Theatre Nerds & ThespianS wag reserve the right to alter, change, or remove any rules or guidelines of the contest. Odds of winning depend on number of entries and winners will be randomly selected from the list of eligible contestants as per the terms of this giveaway. Gifts to indulge your Broadway nerdism and show your thespian pride. 2018 © Theatre Nerds™. All right reserved.